John Nash: A Complete Catalogue. von Mansbridge (Michael), introduction by John Summerson:: Oxford: Phaidon Press 9780714826783 - Staniland (Booksellers) P.B.F.A. 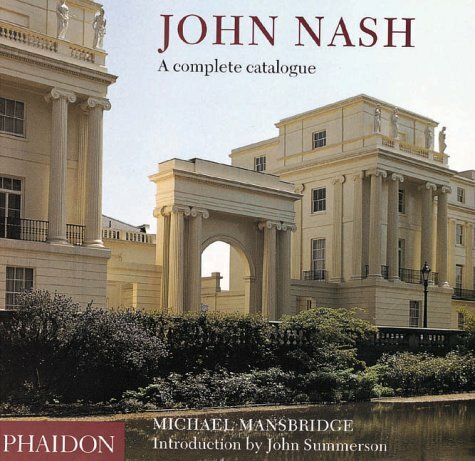 Home Mansbridge (Michael), introduction by John Summerson: John Nash: A Complete Catalogue. John Nash: A Complete Catalogue. Titel: John Nash: A Complete Catalogue. This reference work catalogues and illustrates all the known and attributed works and design of John Nash. Altogether, Nash was responsible for some 230 projects, and these are all illustrated, either by the author's own photographs or, in the case of demolished buildings, by contemporary views and technical drawings. The photographs are supported by captions giving factual data for the use and interest of scholars and general information about the buildings, their settings and their original owners for the general reader. Each caption has its own bibliography and plan where applicable. The book closes with a chronological list of works, a list of patrons and clients, a gazetteer and two maps showing the locations of the works.